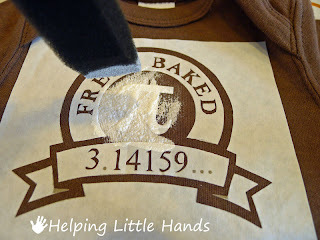 As I mentioned yesterday, we're getting ready for Pi-Day around here. 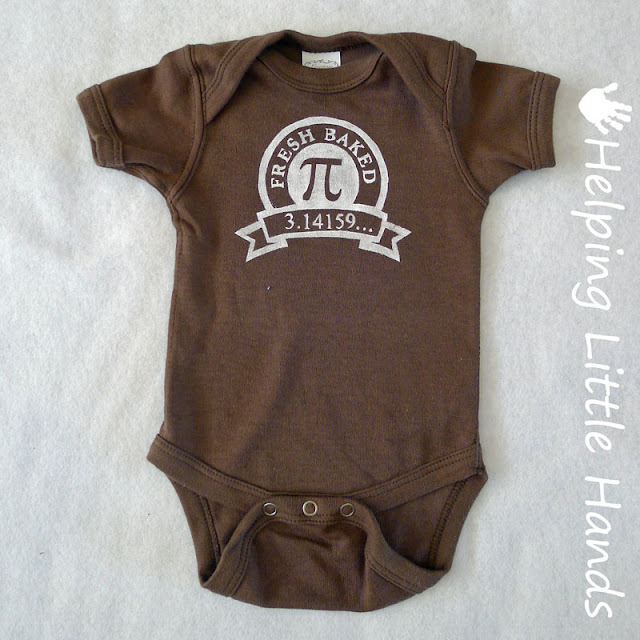 Part of me wanted to wait until I had pictures of our cute baby boy wearing this to show it off...but that would not have left any time for you to make one for your own nerdy baby...so just imagine this onesie is filled by a cute little newborn baby body. 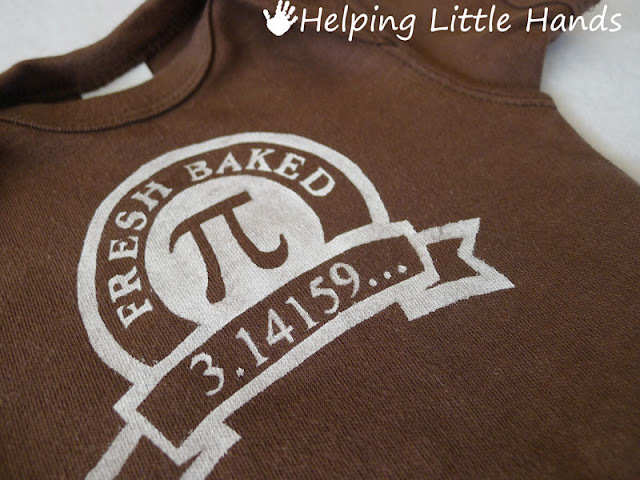 I'm sure I'll post some real pictures of the baby boy himself wearing it sometime around Pi-Day. 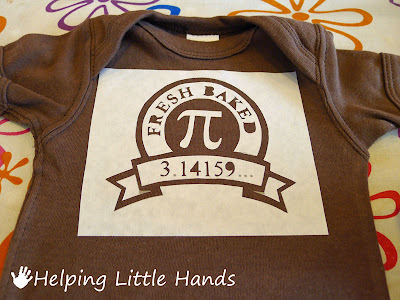 Ever since making my "Pi in the Oven" maternity shirt, I knew I wanted to come up with something involving Pi fresh out of the oven. 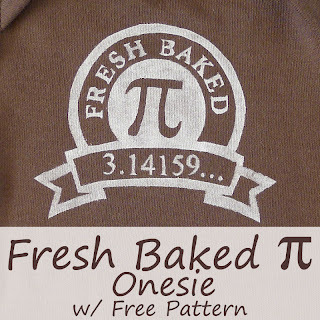 My c-section was originally scheduled for Pi-Day, but it's been moved to March 12th. 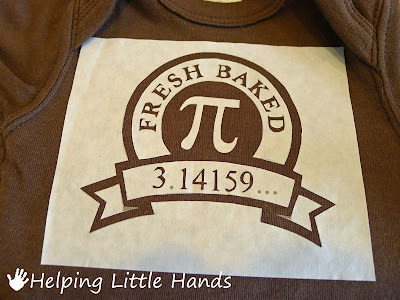 I'm actually just as glad that our baby will be guaranteed a birthday separate from Pi-Day...and that we will likely be home from the hospital in time to enjoy some home baked pie. 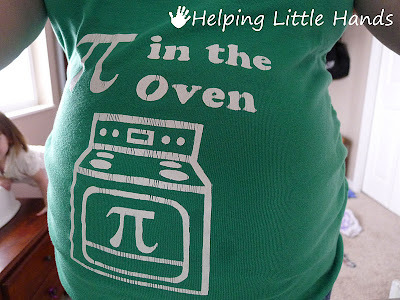 The other kids' Pi shirts from last year (Cutie Pi, Mud Pi, and Sweetie Pi) still fit them, but baby #4 needed one of his own. After all, we don't want him to feel left out. 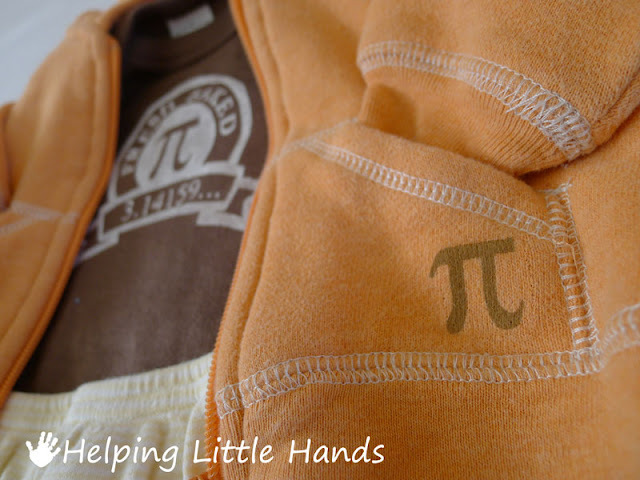 The pants haven't been personalized, but I love the little Pi on the sweatshirt. As is a little out of character for me, I bought this onesie new just for the occasion. (I balked a bit at $4 for a plain onesie...but I knew I wanted a brown one and didn't know if I'd be able to find one at the thrift store.) I found the sweatshirt at Goodwill for $1. 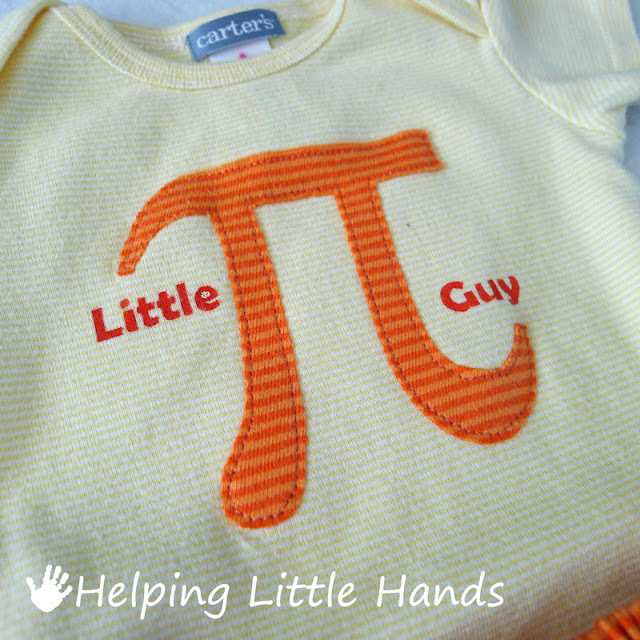 And maybe baby #4 ended up getting two Pi shirts of his very own... You know...just in case he spits up on one of them, he'll have a backup. Here's a little sneak peak, but you'll have to come back tomorrow for more pictures and the free printable pattern for the Little Pi Guy onesie. 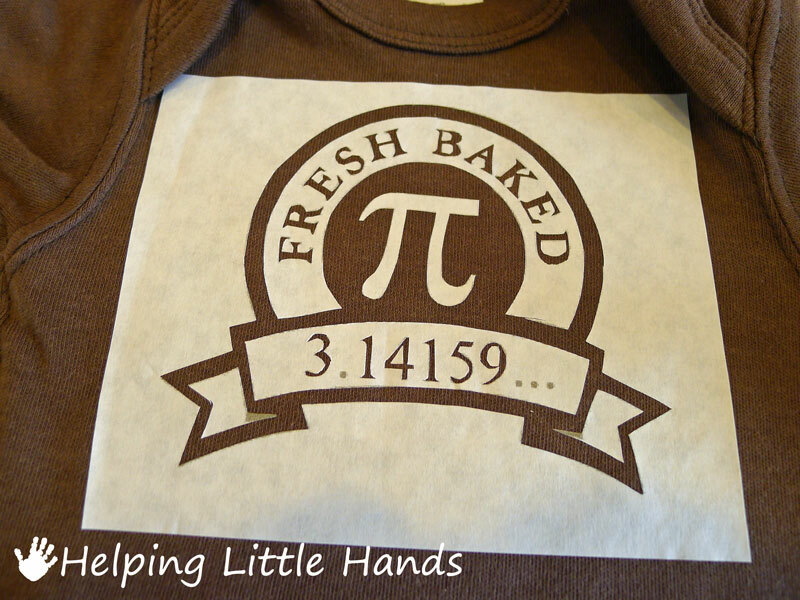 This boy is going to be the most stylish nerd baby coming home from the hospital on Pi-Day...unless of course he comes earlier than Pi-Day...in which case he'll be the best dressed nerd baby in the house..
Usually I give my patterns as PDF, but this one is a JPEG so that you can more easily resize it to fit your shirt. Just right click on the image and you should be given the option to save it to your computer. About 4 inches wide was perfect for a 0-3 month onesie. Here's a quick run-down if you want to make your own. 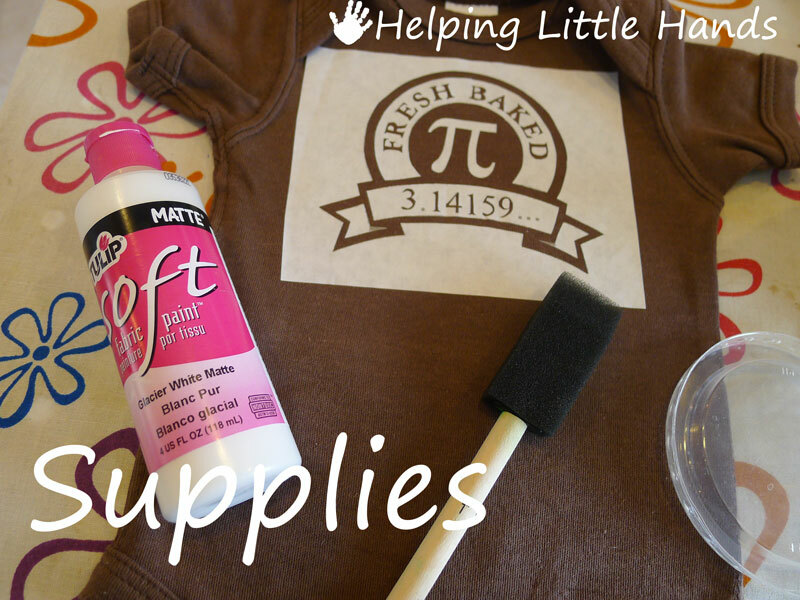 Here's what you'll need...freezer paper, razor blade or something similar, fabric paint, foam or stiff brush, iron. 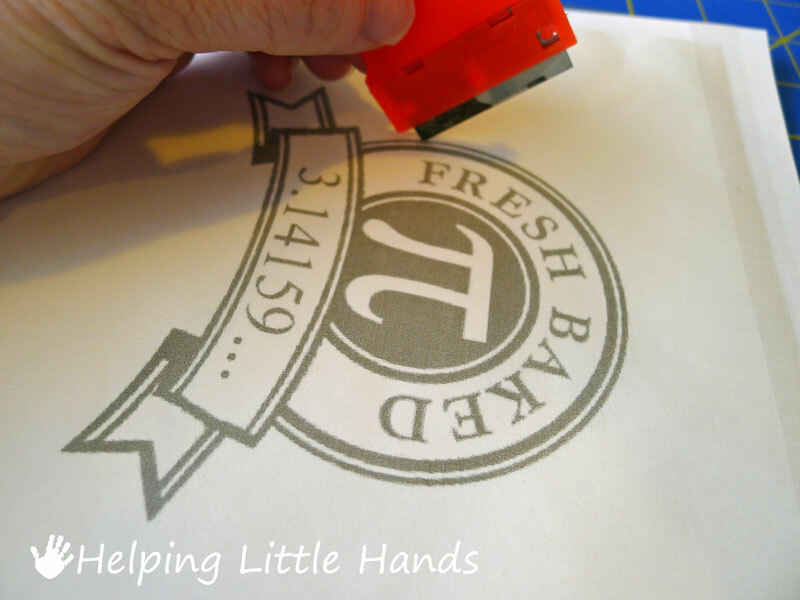 You start by printing out the stencil pattern. I cut my piece of freezer paper just a tiny bit smaller than a regular piece of printer paper. The I tape it at the leading edge to a piece of card stock before running it through my printer. I measured my onesie and decided that a decal about 4 inches wide was a good fit. 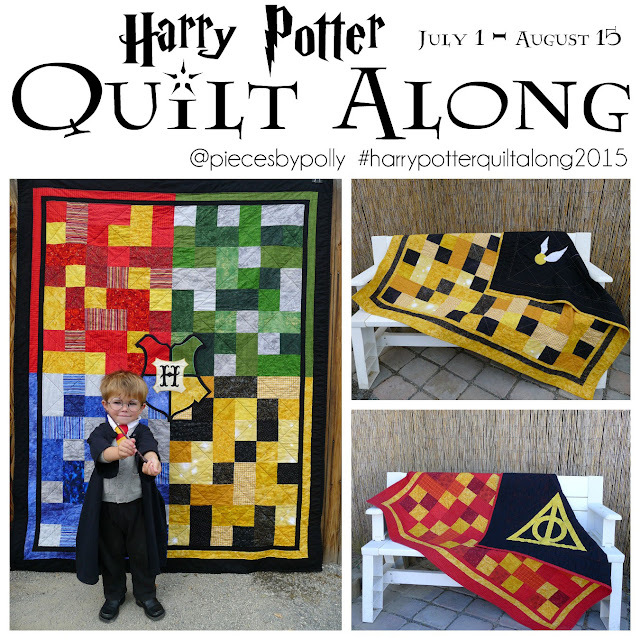 You may want to scale it up for a larger size onesie or shirt. Cut out your stencil with a razor blade or similar tool. 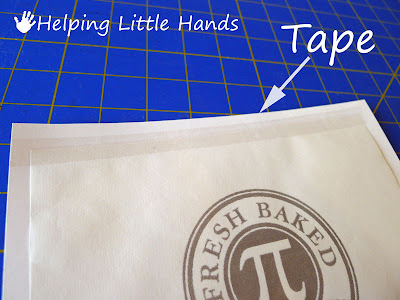 I do it over my quilting mat or you can do it over a piece of cardboard or something else that can protect your work surface. In this case, you're removing everything in black. Be sure to save any white pieces, such as the insides of the letters because you will need all of them. This particular pattern is a bit of a bugger to cut out because of the small letters and numbers and the sarifs...but I liked the look of them, and I think the end result was worth it. Carefully arrange your freezer paper stencil to your onesie or shirt. Make sure it's centered and straight. 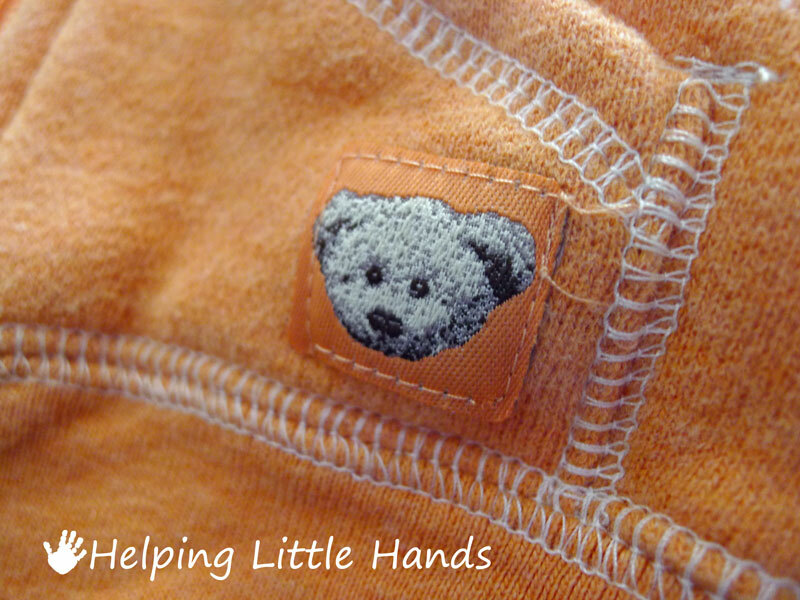 I started by placing the outside piece, ironing, and then placing the inside pieces as few at a time. 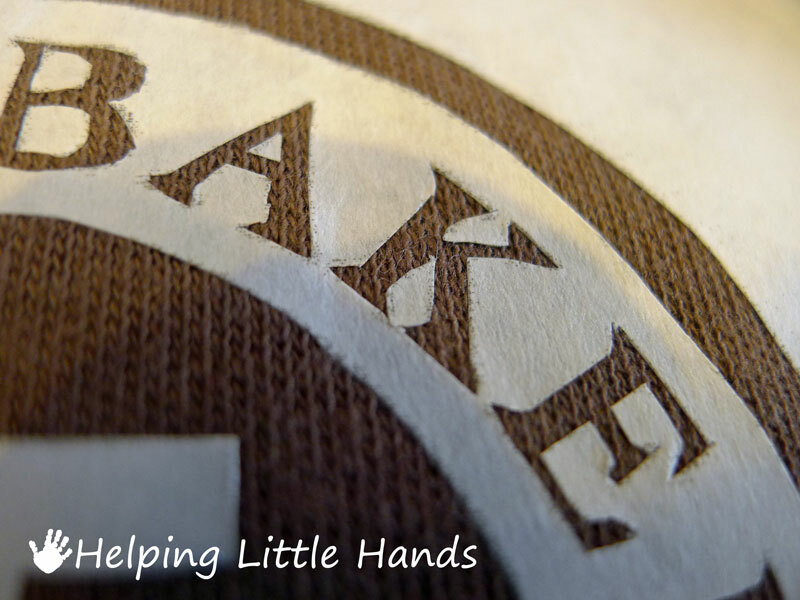 Be sure to include the insides of all the letters, such as R, B, A, and D.
Iron thoroughly and check all the edges. 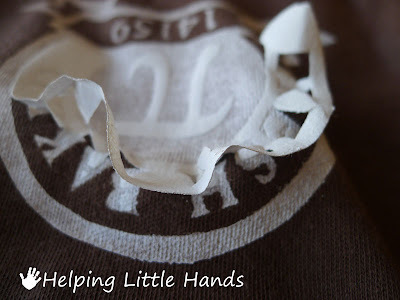 You want the freezer paper to be well stuck so that paint will not seep underneath. 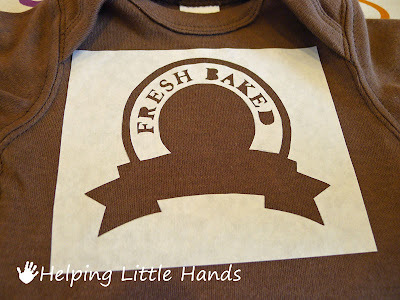 I often use regular acrylic paint for doing freezer paper stenciling. 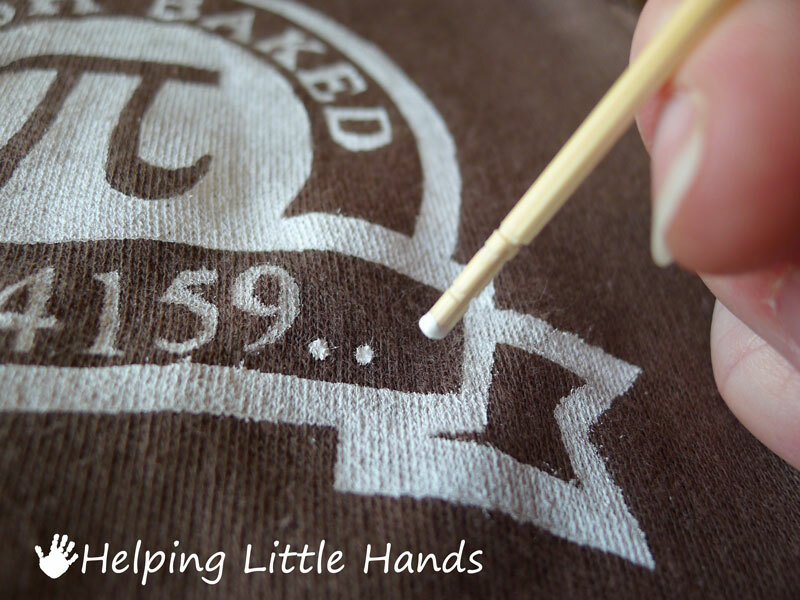 However, when doing a white design on a dark fabric, I use fabric paint. You want to dab it on with a sponge or stiff brush. Do not brush back and forth as this may cause paint to seep under your freezer paper and lead to defects in your final design. Once you've filled in your stencil, allow it to dry. 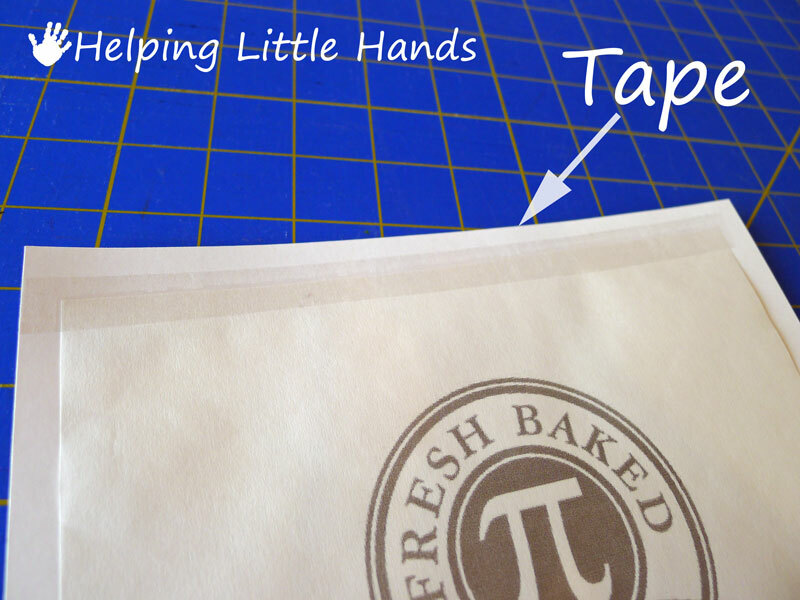 Peel off the freezer paper carefully. I opted to add the decimal points with a toothpick afterward, rather than trying to cut them into the freezer paper stencil. After it is thoroughly dry, iron to set the paint with heat. And you're done. 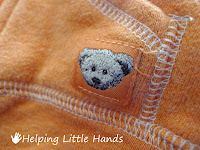 You may want to wash it before wearing, especially if you're putting it on a baby. 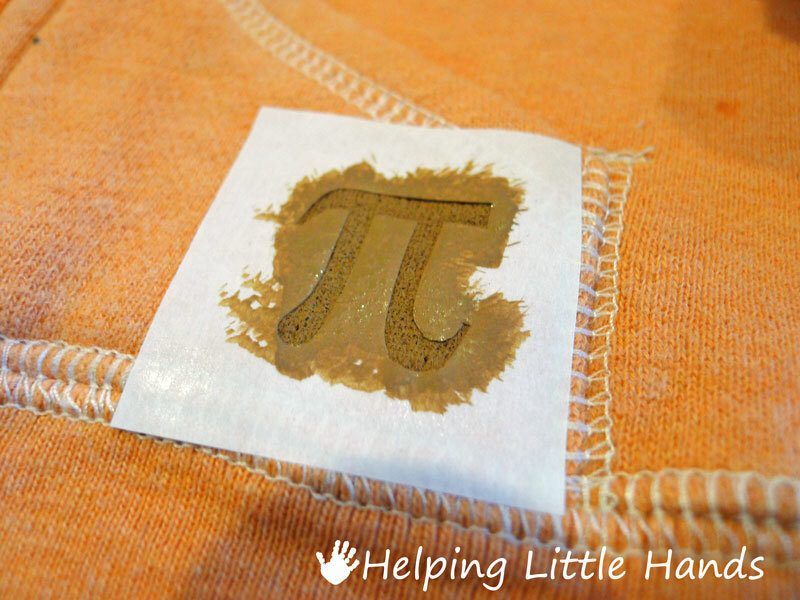 I did the sweatshirt by removing the cute, but totally typical little bear tag, and making a tiny pi freezer paper stencil. 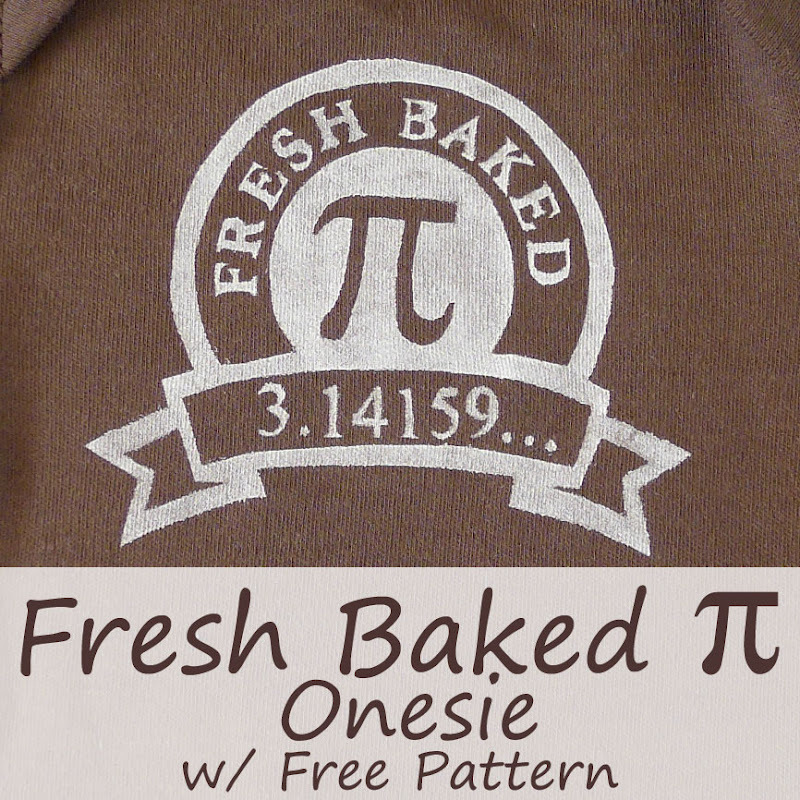 I love the subtly nerdy touch that it adds to the sweatshirt. And if you love math enough to consider making a Fresh Baked Pie Onesie for your little one, you'll definitely want to enter my current giveaway for a Pi Necklace from Boutique Academia. The giveaway is open until March 18th at 12:00am. 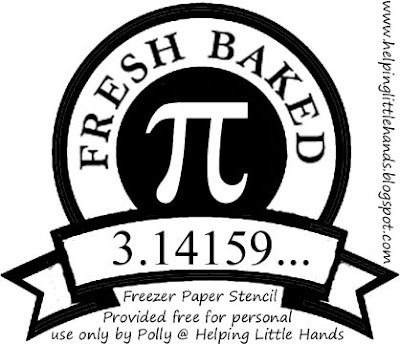 Pi Day is nerdy???? Just seemed to me that the rest of the country is out of step for not making it a national holiday! Cute and so clever onesie. I’d love it if you would consider linking with Busy Monday (open Monday through Thursdays) at A Pinch of Joy, a linky party for ideas that make life better, easier and more fun! Oh, what a lucky little guy this is. You are SO ready for his arrival! 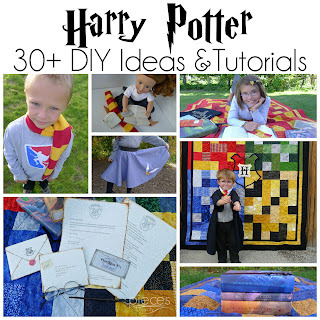 What fun - love all the sweet baby nerdiness. Clever mama. Oh my goodness, I LOOOOVE this!! What a great design! Love love love! Oh man, you really crack me up! I just love this! 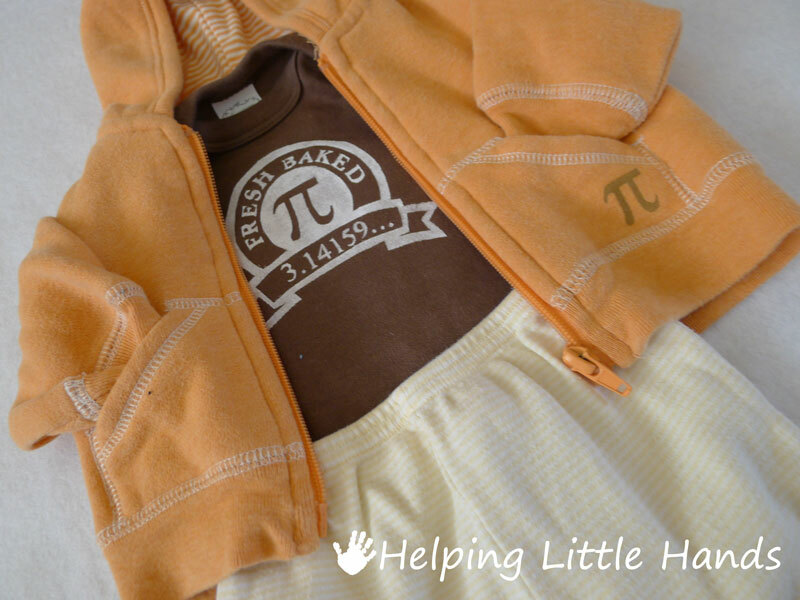 He is going to be one styling little man when he arrives! Thanks for sharing at my party! Love the maternity t-shirt and the tutorial, thank you! I am pinning this. All of those onsies are super cute. Love the 'pie' guy.